This review reveals the most frequent cause of hair restoration center complaints, and ten important questions you should ask before you decide whether to go under the knife. Clearly, hair loss surgery is a drastic option to take. Obviously then, you need to do some very thorough research before you decide to let a hair transplant surgeon anywhere near your scalp. The following three pages will help you do that. This page starts off by giving you ten very important questions: five you should ask yourself, and five you should ask each hair restoration center you’re thinking about using. It then explains the extraordinary costs involved and also deals with complaints to hair restoration centers. 1. Have I already tried every other option available to me? 2. Am I absolutely sure my hair loss won’t get any worse than it already is? 3. Does my hair mean so much to me that I’m prepared to remortgage my house to pay for it? 4. Can I also afford to have multiple transplants if it becomes necessary? 5. How will I feel if the transplant doesn’t work? If you answered "no" to any of the first four questions, then don’t get a transplant! And you can also stop reading this page right now and start looking for better ways*¹ to tackle your hair loss. *¹ For example, my own hair regrowth approach is a totally unique and much more affordable alternative (and totally worth considering if your hair loss is mild or moderate). If you answered "yes" to all of the first four questions, and you also know you can definitely handle it if your transplant fails (question 5) then you might be suitable for surgery. In which case, keep reading. 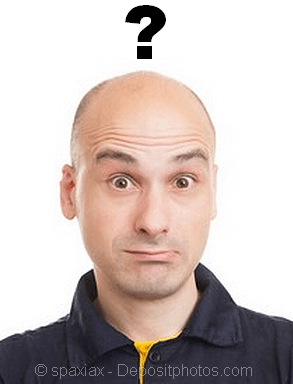 Are You Suitable for a Hair Transplant? Patient suitability is a big factor and must be considered first. Your age, as well as the rate and region of your hair loss (i.e., how much skull expansion*² you have) will determine whether or not you’re likely to get a cosmetically acceptable and long-lasting result (remember, the results you get should last for the rest of your life). *² Your skull shape and the potential it has for further skull expansion and hair loss is crucial. But, unfortunately, if you start asking hair restoration centers about skull expansion they won’t know what you’re talking about! Learn how skull expansion causes hair loss. If you are a suitable candidate for transplant surgery, you should then start asking questions to each hair restoration center you approach. Since a hair transplant is a minor form of surgery, its success is largely reliant upon the skill of the surgeon. So you need to make sure that any surgeon you consider is right at the top of his profession (for a decision as big as hair loss surgery, you should only settle for the best). Unfortunately, there don’t appear to be any hair restoration center reviews that include "league tables" of the centers in each area and the surgeons that work there (a shame really because, that’s obviously something that would be very handy). 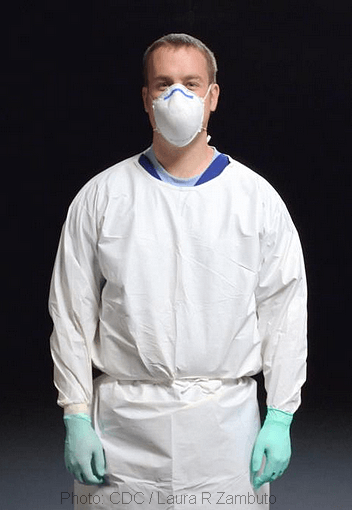 So, for each surgeon, you need to learn about their experience and success (i.e., the number of procedures they’ve completed and the number of satisfied customers). And you also need to know which type of transplant techniques they can perform. 1. Is transplant surgery the main focus of the center? 2. Can their surgeons perform long sessions (5 hours or more) using the Follicular Unit Transplantation (FUT) technique? Note: there are other techniques – the next page explains the different types of hair loss surgery, reveals which one is best, and why. 3. What are the qualifications and reputation of the surgeon who will perform the operation? 4. How many patients have had excellent results from the surgeon? 5. Can they provide several "before and after" photos from previous patients of each surgeon? And are these customers willing to speak (or even meet) with you? The bottom line is: Only choose a surgeon who has years of experience and can prove it. Otherwise, you might end up very disappointed (see image below). Thousands, or even tens of thousands! And this is especially true if you get a top surgeon. 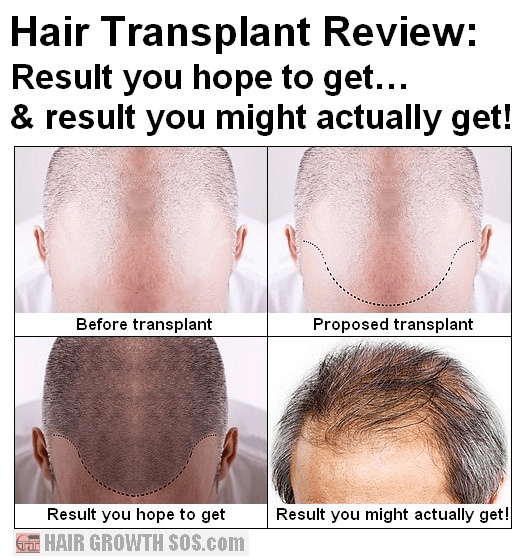 It takes great skill to perform a hair transplant operation successfully, so a surgeon with a very good reputation might charge a lot more. Hair transplant fees are based on the cost per individual graft or follicular unit, and it’s important to find out how each center defines a "unit". That’s because, some hair restoration centers might only charge say, $2.50/unit, but are actually counting each individual hair as a unit. A follicular unit contains between 1 and 4 hairs, and should be transplanted as a whole, not split into separate hairs. So, you need to clarify exactly what you would be paying for. Many patients are also recommended to have additional treatment such as finasteride, minoxidil and laser therapy in order to help keep their new hair (if they don’t do this, they might develop patches of baldness around the transplanted follicles if hair loss continues after the operation). So, does the hair restoration center offer these additional products and treatments? If so, at what price? You would also need to find out what additional consultation fees apply (the costs of each type of transplant technique are compared on the next page). Complaints about hair transplants usually occur because customer expectations are way too high. So this places great emphasis on the need to ask the surgeon exactly what results can be achieved in your particular case. Hair transplants can't give you any more hair; they can only redistribute the hair you've already got. Read next page? Discover the best hair transplant technique.